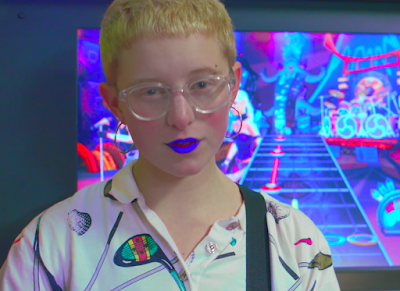 The Le Sigh: Premiere: deer scout - "sad boy"
Premiere: deer scout - "sad boy"
Watch deer scout's new video for "sad boy." I remember being blown away the first time I listened to deer scout's customs. Over the course of just four songs, deer scout invites us into their radically soft world and tempts us to stay there forever. Songs like "holy ghost" and "train song" quietly crooned, while bedroom pop track "up high" energetically swirls and grows louder with each note. Today we're excited to debut the music video for deer scout's newest track. Not only is "sad boy" extremely catchy, it metaphorically tips its hat to non-men who are unapologetically forthright about their feelings. Read deer scout's statement on the song and watch Dena Miller don blue lipstick and play video games in the footage below. "I got into music in a scene that is especially dominated by men who write vulnerable, self-loathing lyrics. Sad Boy references music I love and that has influenced me, but absolutely falls into this camp. Katie Crutchfield of Waxahatchee, who is a big inspiration for me, pointed out that when non-dude musicians write songs about their feelings it gets called "confessional' but when men do it it's just called 'honest.' The issue isn't men being vulnerable, though sometimes I think it gets put on a pedestal. The issue is that non-dudes have always embraced softness and vulnerability and never get enough credit for it." Listen to deer scout on bandcamp.